Whether you are looking for the perfect gate to beautify your Del Mar home or business, or would like to install protective fencing to increase security at your property, call B.A. Ramirez & Sons Ornamental Iron Works, Inc.. When it comes to custom ironwork, no one in San Diego County offers a better value. Our iron fence fabricators have extensive experience designing, building, and installing ornamental and wrought iron fences, gates, railings, doors, window guards, handrails, guardrails, and enclosures. 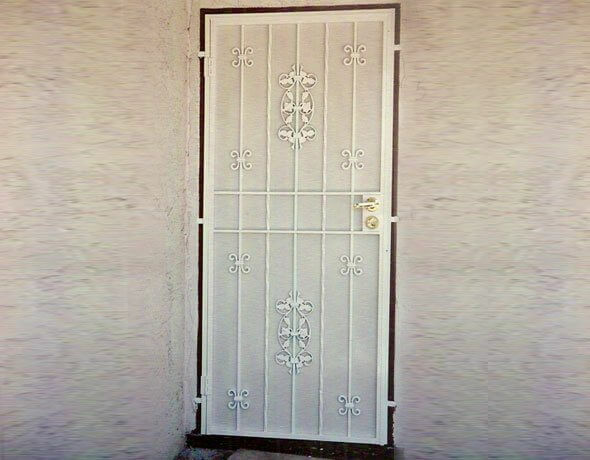 Our ironwork is fully customizable to fit every style preference, functional need, and budget. Additionally, we offer repair and replacement services for damaged ironwork. As a second-generation, family-owned business, B.A. 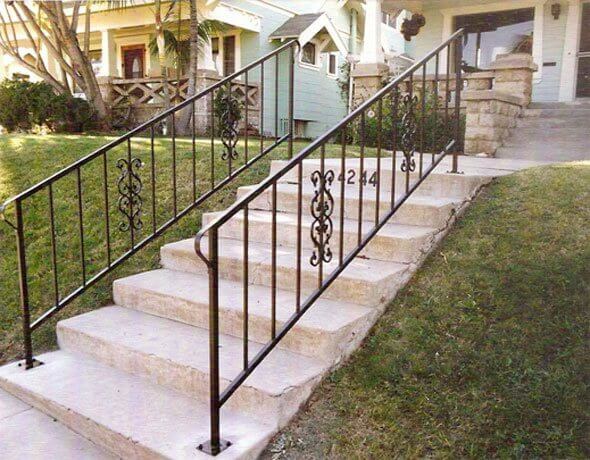 Ramirez & Sons Ornamental Iron Works, Inc. is a highly experienced ironwork contractor. Our owner, Mike Ramirez, has over 30 years of experience working in the iron works services industry, and many of our employees have over four decades of industry experience. With our level of knowledge and expertise, we are able complete commercial or residential projects of any size. Because we also provide highly personalized service and work closely with clients throughout all stages of their project, we consistently deliver quality fences, gates, railings, window guards, and doors that fully meet, if not exceed, client expectations. In fact, with our commitment to service, we have earned an impressive customer return rate and a large portion of our new business is the result of satisfied clients referring us to their friends, family, and associates. Contact B.A. Ramirez & Sons Ornamental Iron Works, Inc. today and learn about our comprehensive iron work services for Del Mar customers. We are licensed, bonded, and insured, and stand by all of our Del Mar iron fences, handrails, guardrails, staircase railings, manual/automatic gates, doors, and window guards with written warranties. At B.A. 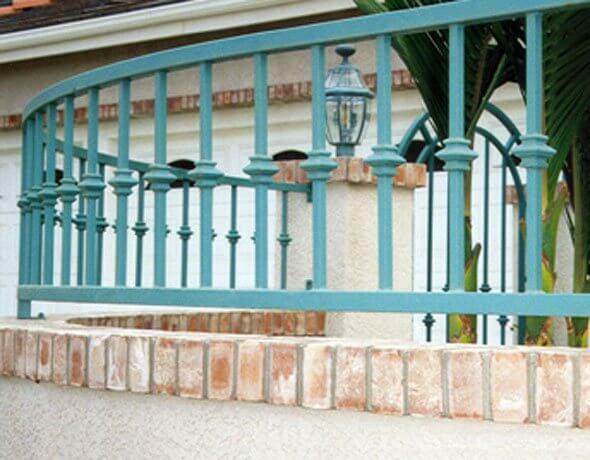 Ramirez & Sons Ornamental Iron Works, Inc., we can create any style of iron fence to enclose your Del Mar residential or commercial property, from a simple picket fence with spears to a highly ornate fence with hammered scrolls and integrated decorative castings. These fences can be custom-designed to be the perfect complement to your garden, front yard, backyard, pasture, pet enclosure, or pool. In addition to new and replacement fencing, we also install fence toppers and railings that can be mounted to walls or existing columns. In all cases, we use quality, moderate- to heavy-weight iron and make our fences with Old World forging techniques. By hand-forging each iron fence, we can give you a longer lasting fence as well as replicate any design that you could imagine or have seen. Please call us today to learn more. At B.A. 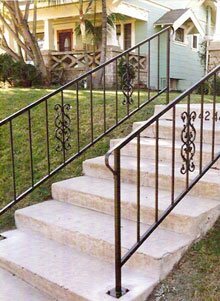 Ramirez & Sons Ornamental Iron Works, Inc., we custom-design all types of Del Mar residential and commercial iron railings, including iron stair railings, balcony railings, guardrails, and handrails (all of which can be built to conform to ADA requirements). 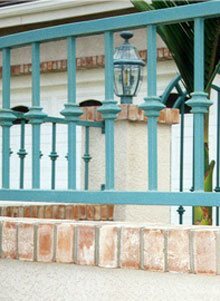 Our iron rails for Del Mar are available in both simple and ornate designs, and we specialize in decorative wrought iron railings that will enhance the look of your home or business while also improving safety. We offer an endless array of options for your commercial or residential railing needs in Del Mar and will work closely with you to ensure you get the best ornamental or wrought iron railing for your budget. Call us today to get started. B.A. Ramirez & Sons Ornamental Iron Works, Inc. offers Del Mar customers custom-made window bars and doors that are affordably priced and effective at improving safety, security, and/or privacy. Our doors and window guards are designed with both style and function in mind as they can be constructed with the most up-to-date safety features available in the industry today. This can include code-approved fire releases for window guards and access control systems, intercoms and telephone entry systems for our iron entry doors and decorative enclosures. The benefit of having a custom-made door and/or window guard is you'll be sure to get a piece that perfectly fits and enhances the look of your property. Call us today to learn more about our iron window guards and doors for Del Mar homes and businesses. Call B.A. 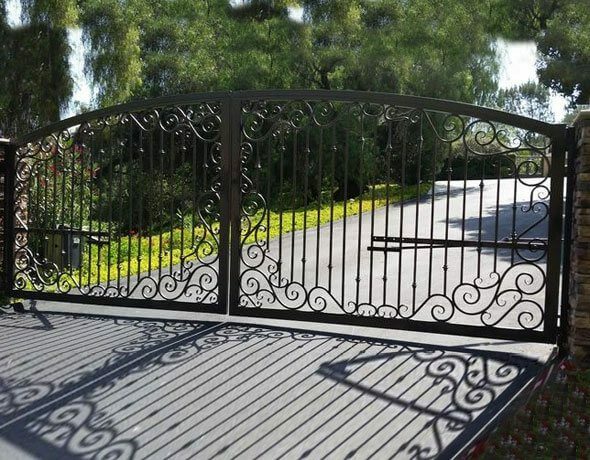 Ramirez & Sons Ornamental Iron Works, Inc. today and we will design, craft, and install any type of iron gate you desire for your Del Mar home, commercial property, or residential community. 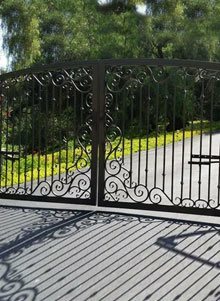 Whether you want an elegant, automated driveway gate or a simple side gate with a latch, our custom iron gate services will ensure you get the precise gate your need and want. 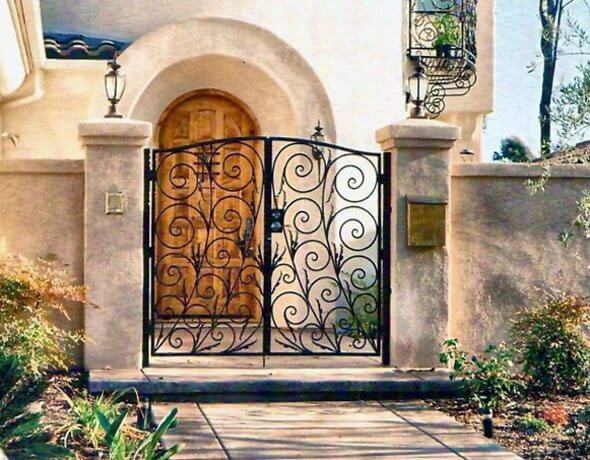 We offer tubular and solid iron, as well as a wide range of design and finish options, all to ensure you get the perfect iron gate for your Del Mar property. 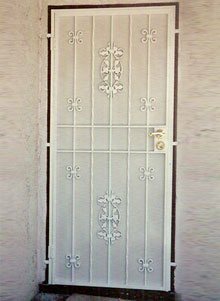 For example, if you want a security gate, we can use heavy-gauge steel and state-of-the-art access system; but, if you want a decorative gate, we can hand forge a gate out of ornamental iron and integrate scrolls, oak leaves, and even your surname initials. Call today for a personalized consultation. Call the gate experts at B.A. 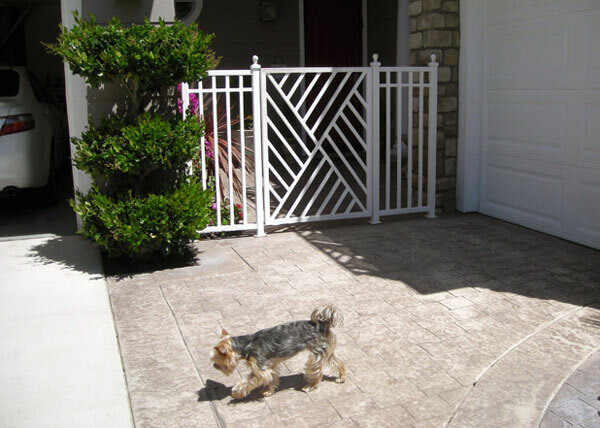 Ramirez & Sons when you need a motorized/automated gate for your driveway in Del Mar. We have decades of experience custom building, installing, repairing, and replacing iron gates that are designed to operate with a gate operator and access control system. Not only do we have the capacity to realize any iron gate design and have it fit nearly any width, but we can also have it function exactly as you wish.These gates can open as you approach, with the touch of a button, by swiping a keycard, by entering in the right code on a keypad, or with the approval from a resident's landline. We can also integrate safety features, such as Opticom devices and "photo eye" sensors. We are qualified to install and repair all major gate operator and access control system brands, including LiftMaster, DoorKing, Elite, All-O-Matic, Linear, RamSet, and more. If you are in the Del Mar area, we are happy to arrange an on-site, no-obligation consultation for free. Since 1980, B.A. Ramirez & Sons Ornamental Iron Works, Inc. has created beautiful, functional, expertly-crafted iron work at affordable prices. By offering the best value in ironwork with timely service, honest business practices, and outstanding customer service, we have earned thousands of satisfied commercial clients throughout San Diego County and the Del Mar area. Whether you need an iron fence to enclose your commercial property's perimeter or to delineate various aspects of your Del Mar property or business, we will design our iron fences to work perfectly according to your needs. We also offer a wide range of other structures, such as ADA-compliant handrails, window guards with fire releases, gates with access control features, and code-compliant railings, that meet today's building codes for commercial properties and that raise the curb appeal of your storefront. Contact us today for a free design consultation or online estimate. For decades, B.A. 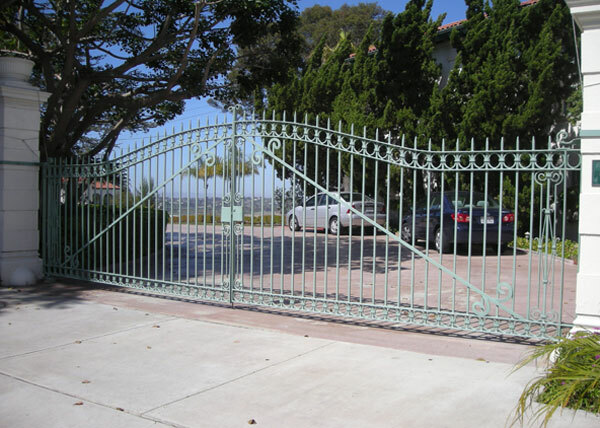 Ramirez & Sons Ornamental Iron Works, Inc. has provided Del Mar homeowners and residential communities with expertly crafted iron work, including iron fences, safety handrails, automated gates, manual gates, screen doors, enclosures, and window guards/burglar bars. Our residential iron work is always custom designed to suit our customers' unique needs, budgets, and aesthetic tastes. Customizations can include ornate casted designs, hand-forged scrolls, attractive powder coat finishes, privacy screens, brass or copper backings, and access control systems. Call us today to learn more about our residential iron work for Del Mar; our iron work professionals have decades of experience and are familiar with the needs of homeowners, HOAs, and property managers. G23 This hand forged style gate was installed in Del Mar CA. 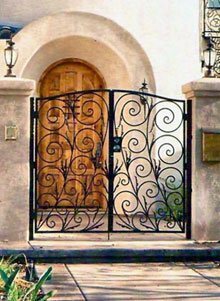 The scrollwork is made using ½" solid steel bar that is heated in our forge, hammered and formed for the gate. G26 Installed at the front of this residential Del Mar home, this modern style gate keeps unwanted individuals from the front door. The gate is made with a 1.5" steel tube frame and 1" steel tube pickets. DW7 We installed this arched English style steel gate in Del Mar, CA. The arched design of this gate is topped off with decorative spears and features ring designs on the top and bottom. Reinforcing diagonal bars make it a strong and sturdy gate.